Such an awesome place to visit for any craft beer enthusiast. It's only a mid sized tap room but tasting the beers they have on tap is an experience unlike any other brewery. It's somewhere in San Diego in the business district. I was sleeping off some beers from the previous brewery so I can't really help you here. Despite being a yeast manufacturing (cultivating?) facility, the taproom looks like a normal taproom. There's a window where you can see into a portion of the lab, but to see the full works, you have to take the tour. There are Erlenmeyer flasks hanging from the ceiling as light bulbs, and used yeast vials for tap handles. These guys are pretty creative. I've got to tackle this section a little differently because they serve beers in a different way here. Rather than order a flight of completely different styles, you can order the exact same style of beer brewed with different types of yeast. 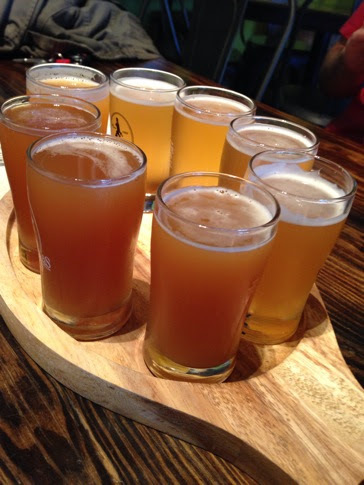 For example, the pale ale flight was the exact same beer recipe, but split into four batches and each batch was fermented on a different type of yeast. 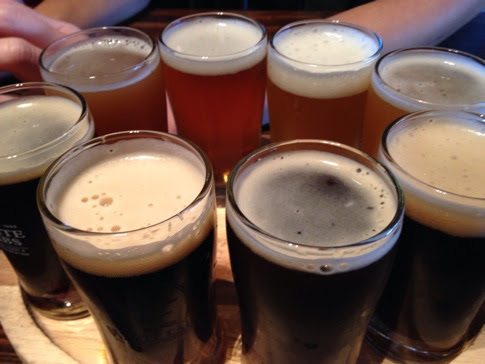 The notes below are a little rambling and might not reflect the exact flavors of the beers because while comparing and contrasting was easy to taste, it was very difficult to write down! 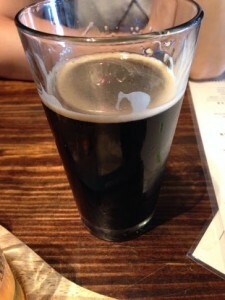 I'll also add some comments on the awesome Frankenstout I had! chocolate. Lacking in roasty flavor, but does have some roasty aroma. Fewer fruity esthers than 004, but different flavors too. russian imperial stout flavor. higher alcohol. more earthy, less fruity. bready, dried fruit. Doesn't really stand out and hard to describe. sour, funky, spicy. Most sour of the flight. yup, tastes like brett. Now that's some horse blanket! biggest hop aroma of the four. I was most excited to try the Frankenbeers, which are different styles of beers fermented with 96 different strains of yeast. For anyone reading this that doesn't understand the gravity of what that means, normally a beer is fermented with just one, MAYBE two-three strains. There was a lager, an IPA, and a stout. I've been on a stout kick lately so I picked the stout. There were the normal chocolate and coffee flavors, and smooth + creamy mouthfeel. The odd flavors only really came though in the middle and end. There seemed to be a lot of fruity esthers. I could taste some dark fruit, maybe some kind of berries. The strangest part of the beer was definitely the lingering flavors after I finished taking a sip. There was a lot going on here – much more than I can really describe. It was very evident that this was no normal beer! They also had some Berliner weisse beers which were completely awesome. One was brewed with apricots. I'm a huge fan of sour beers, and it's a real rarity to get to drink some Berliner weisse. My friend who has spend some time in Germany says that they were pretty close to what you'd get over there. You can bring your own food here. One of the annoying things is that some people got Chinese takeout half way though the tasting session which made detecting any kind differences in the aromas pretty impossible. We didn't ask many questions about the beers here, but the beer server was very friendly. I even bought a used White Labs beer glass (with the old logo) for $3 because she didn't have any new ones (only with the new logo). This was an unforgettable trip and any beer lover that's passing though San Diego must go. I'm really inspired to do my own experimentations with different types of yeast and fermentation conditions. I've already bought Yeast (it's a book) from Jamil Zainasheff and Chris White and am leafing through it. Check out my reviews of Firestone Walker and Barrelhouse from the same trip! Alesmith is coming soon!